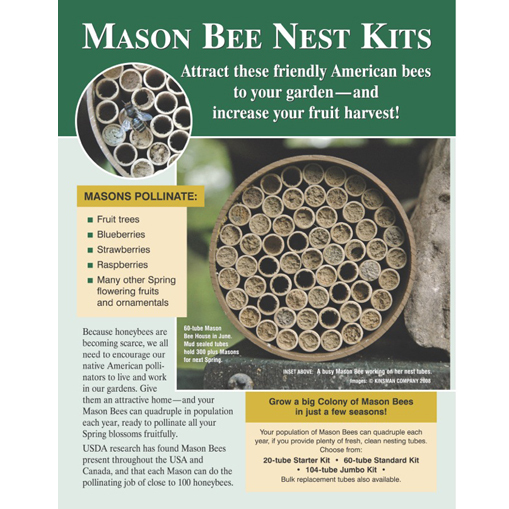 The new model Kinsman Orchard Bee Nest contains 52 x 6-1/2" nesting tubes in a sturdy housing made of 100% recycled prolypropylene. Each nest tube is made from Kraft paper with acetate wrap for strength and moisture protection. 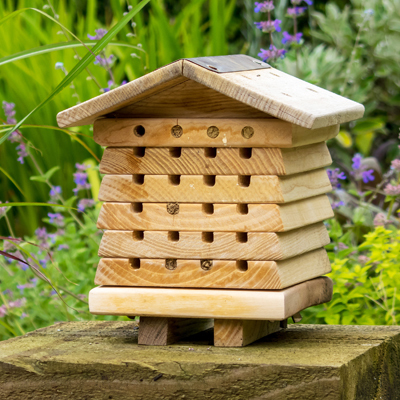 Position your Bee Nest Kit firm and level in a sheltered sunny spot, facing East or South, where it won't be disturbed. 6 to 8 ft. high is a good height. 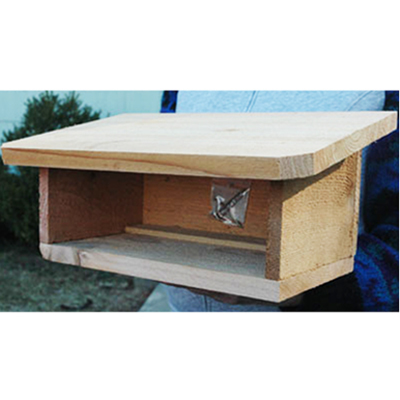 The new model Kinsman Orchard Bee Nest contains 92 - 4" diameter x 6-1/2" nesting tubes in a sturdy eco-friendly biodegradable housing made from bamboo and rice hulls and cardboard tubes in Masons' preferred size (6" long and 5/16" diameter) Position your Bee Nest Kit firm and level in a sheltered sunny spot, facing East or South, where it won't be disturbed. 6 to 8 ft. high is a good height. 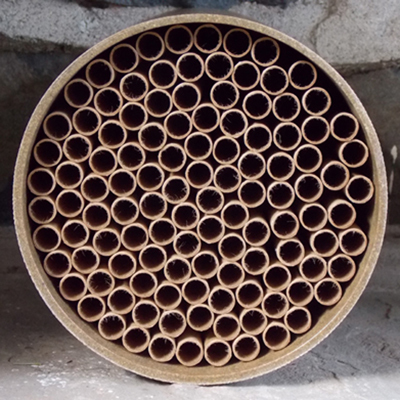 Mason Bees like to nest where it's dry and protected from weather - under the eaves of a shed or garage. This handsome red cedar shelter holds three of our 52 Tube Standard Mason Bee Houses (included) . 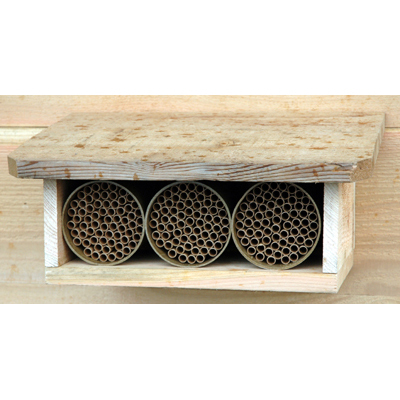 CS/3 - Mason Bees like to nest where it's dry and protected from weather - under the eaves of a shed or garage. Handsome red cedar shelter holds three of our 52 Tube Standard Mason Bee Houses. Easily mounted with pre-drilled holes in back. Screws included. Overall Dimensions - 14 ¼" long x 7" tall x 7-½" front to back. This shelter is empty. Case of 3. 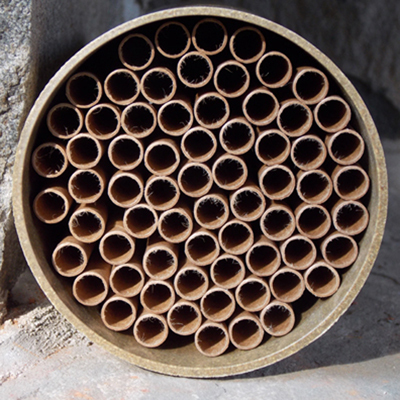 Try to provide fresh nesting tubes for your Mason Bees, to replace tubes that have been used last year. This helps protect against a buildup of parasitic mites that can carry over in used tubes. Unused tubes are still good, of course. 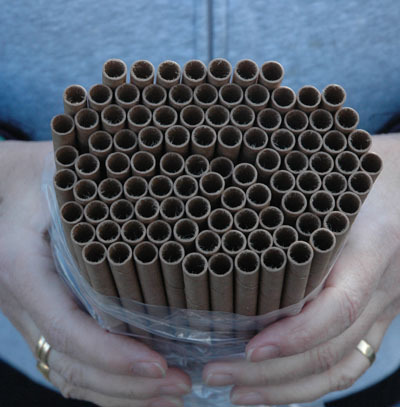 Each tube is 6" long x 5/16" diameter.